Sometimes the simplest of gifts can be the most romantic. This Valentine’s Day, why not surprise that special someone with a set of Valentines Day coffee mugs that express your romantic side. These coffee mugs are great by themselves, or why not fill them with some sweets, or small packets of your loved one’s favorite coffee or tea. BoldLoft creates and manufactures various romantic gifts for couples, and one of their popular products is their “From My Hear To Yours” Couple Coffee Mugs. These coffee mugs can really set the mood for romance this Valentine’s Day. 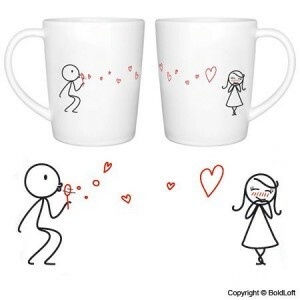 These are cute little coffee mugs that express your love in an amusing and cute way. These will soon become the favorite mugs to use for any couple. Reviews for the “From My Heart To Yours” Coffee Mugs are exceptionally positive. Customers like giving and receiving these cute mugs. In fact, there are absolutely no complaints regarding these mugs at all. Another perfect coffee mug set by BoldLoft is the “Catch My Love” His And Her Coffee Mugs, which is a wonderful gift idea for Valentine’s Day or any other occasion. These cute coffee mugs are both fun and romantic. The little stick man catching the heart kisses is absolutely adorable, and a great way to show to show how much love there is between the couple. Reviews for the “Catch My Love” Coffee Mugs are extremely good, with most customers finding these mugs cute and using them on a daily basis. 3D Rose is a company that offers original gifts, including putting your own chosen photo on light switches, covers, desk clocks, shirts, mugs and more. This Best Husband Ever Coffee Mug is a great way for women to express their appreciation for their husband on Valentine’s, an anniversary, birthday or just because. This mug is sure to please, and bring a smile of pleasure and a sense of pride to any husband who receives it. This is a handsome coffee mug, clear in its sentiment, and extremely masculine. Any husband would be thrilled to have this mug as a daily reminder of what you think of him as a husband. Reviews for this Best Husband Ever Coffee Mug are few and far between, but one hardly needs to see a review to appreciate and understand the true use of this mug and the wonderful message of love. Starbuck’s is an extremely popular and well known coffee chain. This Valentine’s Coffee Mug from Starbucks is sure to express your love for that special someone and their love for good coffee. This is a cute coffee cup, but the message may be far more subtle than what many people are looking for. While the ampersand does indicate more than one, as in “You and Me”, some people just may not get it. There is only one review for this Starbuck’s Valentine’s Day Coffee Mug that can be found, and while it is good, it really doesn’t give enough information to provide a consumer with sufficient insight. However, the mug appears well made, and anyone who likes Starbucks is sure to be proud to own this coffee mug. A Valentine’s coffee mug can be a unique and thoughtful way of telling that special someone how much they mean to you, especially when it carries a cute and thoughtful message of love.